Struggling to track down one last stocking-stuffer for anyone on your holiday shopping list? If they happen to own an iPhone, iPad, or iPod touch, the App Store offers more than a half-a-million last-minute gift options. And gifting features in iTunes make giving the gift of apps as easy as a few clicks. You can find the Gift This App option by clicking the triangle next to the app’s price. 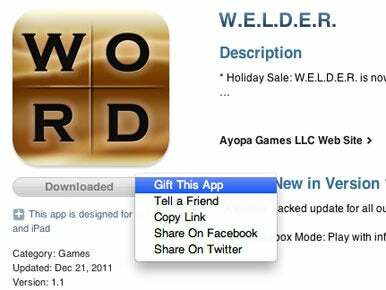 Each paid app in the App Store offers a gift-giving option. Just click on the triangle next to the download bar that lists the app’s price. You’ll see a pop-up menu with the following options: Gift This App, Tell A Friend, Copy Link, Share On Facebook, and Share On Twitter. It’s that first option you’ll want to click. Before you do, though, make sure to check the app’s requirements to see if it will run on the device of your recipient. You don’t want to inadvertently gift someone an iPad-only app if they only own an iPhone, say. Similarly, some apps won’t run on older iOS devices. Most App Store listings are pretty clear when it comes to the devices the app supports. I hope my mom doesn’t read this article, or one of her gifts is spoiled. Let’s say you’re giving an email gift. The Sender’s Name field is already filled in for you, with your first name listed. You then enter the recipient’s name followed by an email address; another field asks you to verify the email address by entering it again. Finally, iTunes gives you a space to leave a personal message to your recipient. Try to capture your sentiments in less than 500 characters because that’s the maximum number you’re allowed. Tap continue and—if you haven’t purchased anything recently—you’ll be asked to supply your iTunes password. (In the unlikely event you don’t have an iTunes account, you’ll have the option of setting up one in that dialog box.) After signing in, you’ll see one last screen for reviewing your purchase; click Buy, and your gift will wing its way electronically to your loved one’s inbox. Should you take the print-it-yourself route, the process is similar, though with fewer fields. Those superfluous email address fields disappear, leaving you just to enter your name, your recipient’s name, and the message. After reviewing the purchase, you then get a screen for printing up the gift certificate. Try and use a color printer if at all possible—the certificate comes with a stylish green border and a lovely recreation of the app’s icon. Now when I was testing this feature, I started to type notes in what I thought was my open text editor; turns out I was still in iTunes, and my ham-fisted typing made the printing page disappear before I could print it out. Not to worry—all you have to do is log in to manage your iTunes account by clicking on your account name in iTunes’s upper-right corner. You’ll be asked to enter your password again. From there, scroll down to Purchase History and click on See All. Search for the specific purchase, click on that, and you’ll see the gift certificate with a print option. Try not to make a hash of it this time. Another grateful loved one enjoys the gift of an iOS app. While I prefer to do my app gift-giving on my MacBook Pro with its physical keyboard for easy data entry, more mobile-inclined shoppers can give apps as gifts through the App Store app on their iOS device. Go to a specific app page and scroll downward—the Gift This App button appears just below the sample screenshots and user ratings, just to the right of the Tell A Friend button. You’ll need to sign in once you tap Gift This App, but from there, the process is identical to the one described above. If you don’t have a specific app in mind—or if you think your recipient would prefer to pick out their own gift—you can always opt for an iTunes Gift Certificate. You’ll find physical cards at any Apple Store near you, not to mention in the gift-card section of most grocery stores and retailers. If that’s not an option, though, you can still turn to electronic gift giving. Go to the home screen in the iTunes Store, and find the Buy iTunes Gifts option—it lives in the Quick Links area on the right side of the screen. Click Buy iTunes Gifts, and the next screen will give you the option of ordering a gift certificate, with email or print options. Select the email option, and you supply the recipient’s name, email address (entered twice for verification purposes), and a personal message. You can also set an amount, ranging from $10 to $50 in $10 increments. 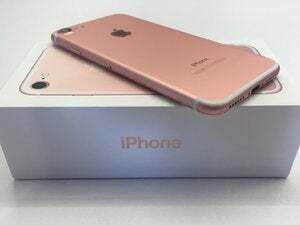 Once you confirm the purchase, the gift certificate is sent on its merry way to your recipient to redeem (for use in the iTunes Store, App Store, and iBookstore) at their leisure. If you prefer to control when and where your recipient gets their gift, you’ll want to take the printable certificate option. The process works as it does for emailed gift certificates, but without the email address fields. Confirming the purchase takes you to a print screen where you can output a paper gift certificate festooned with a silhouetted dancer from the iPod ads of old.